KIM LAWTON, correspondent: About 20 minutes outside New Orleans, worshippers gather at First Baptist Church in Chalmette, the largest city in St. Bernard Parish. It’s a pretty typical Southern Baptist Sunday morning service. REV JOHN DEE JEFFRIES (Preaching at First Baptist Church, Chalmette, Louisiana): Lord, what’s going on? Lord, why? LAWTON: But that belies the incredible journey this congregation has made since Hurricane Katrina. More than half of the churches in St. Bernard Parish still haven’t come back, and most of them probably never will. First Baptist is not only back, but reinventing itself to help a community still struggling to recover. REV. JOHN DEE JEFFRIES (First Baptist Church, Chalmette, LA): The church is up. She’s not yet standing on her own two feet, if I can say it that way, but the church is here, and the church now has a hope and a future. LAWTON: Hours before Katrina hit, Pastor John Dee Jeffries and his wife, Genny, evacuated to their daughter’s home near Baton Rouge. They expected to be gone a couple of days. JEFFRIES: The hurricane had passed through, all seemed to be well—the initial reports, and then suddenly everything turned topsy-turvy. LAWTON: The levees were breached, and within a half-hour St. Bernard Parish was inundated with water. 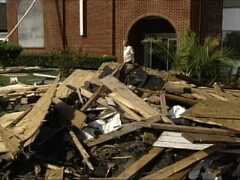 The damage was incomprehensible, and First Baptist Church didn’t escape the destruction. JEFFRIES: The church—the church was a heartbreak. It was as if everything that had substance, value, meaning, purpose, the things that form the backdrop of your life suddenly ripped apart, shredded before your very eyes. LAWTON: The Jeffries’ home was also among the thousands destroyed. GENNY JEFFRIES: That’s when I cried. I only cried one time, and that was when I saw my home. LAWTON: They ended up living in a FEMA trailer near their daughter, 85 miles away from Chalmette. Jeffries started thinking about rebuilding. GENNY JEFFRIES: Wasn’t a real long time before he decided he was going to come back. LAWTON: Did you think he was crazy? GENNY JEFFRIES: Mm-hmm. I mean, the church was devastated. We were devastated. Every house, everything in Chalmette was destroyed. Everything. JEFFRIES: I certainly have no negative feelings about ministers who felt that they could not come back. But there was something inside of me that could not accept that as my future. LAWTON: And slowly a plan started coming into focus. Then Jeffries connected with a faith-based ministry called Builders for Christ. JEFFRIES: And the sound of them, their leaders standing and saying, “We have decided to build your church.” I can still feel that in here. LAWTON: It was a huge project that still isn’t completely finished. More than 3,000 volunteers from 34 states and the District of Columbia helped out. 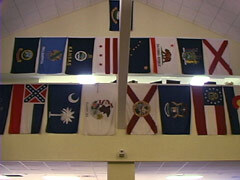 Flags at the back of their new sanctuary serve as a constant reminder. JEFFRIES: Every denomination imaginable including Jewish people have come and worked on our project—Assembly of God, Baptists, Presbyterian, Methodists, Catholics. They’ve all been here. LAWTON: The outpouring was a huge inspiration to longtime members like Michael “Slim” Gillette, who’s the chairman of the deacons. MICHAEL GILLETTE: The more the church was built, the more healing took place for me. 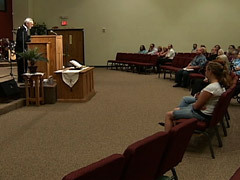 LAWTON: They held their first service in the new church in September 2009, four years after Katrina hit. Before the storm, about 400 people attended on a regular basis. Now they’re averaging about 150, but the numbers are steadily rising, with more than 90 new baptisms in the past year. Ninety-seven percent of the people who came to First Baptist prior to Katrina haven’t returned. There’s a new cultural diversity, with growing numbers of African Americans and Hispanics attending, and many of the new people didn’t previously attend church at all. GILLETTE: We don’t have a church congregation now like we used to have. They don’t know the hymns. They don’t know the difference between Mass and worship service. We’re learning together what their needs are, and they’re learning what we have to give. LAWTON: One of the new members is Leola Thomas, who, like most people here, lost everything in Katrina. LEOLA THOMAS: When I came in and saw and heard, you know, how he teaches about Jesus and his love, and the love they showed to me, I said this is the place that I want to be in. JEFFRIES: There’s something happening inside of the hearts and minds of people that has brought us all together, and it’s strange to see how God is making us the one body of Christ. There are challenges in that, but it’s happening. LAWTON: And it’s happening in a community that still hasn’t fully recovered from Katrina. This neighborhood used to be a pretty typical middle-class subdivision with lots of houses close together. Now there are a lot of empty lots where houses have been torn down. Some homeowners have returned, but a lot of houses are still standing unrepaired and empty. The financial stresses of Katrina, along with the recession and now the Gulf oil spill, have generated a severe economic crisis across St. Bernard Parish. About 40 percent of the First Baptist congregation is unemployed. First Baptist partnered with the nonprofit group Second Harvest to create a food pantry which distributes almost 20,000 pounds of food every month. JEFFRIES: I’m absolutely astounded at how powerful this ministry is with so few people manning it. LAWTON: First Baptist has set up a daycare center and after-school program to help working parents, and there’s also a Christian addiction recovery ministry, which is close to the heart of Tina Rivera. After Katrina, she, like so many, sought to numb the pain. TINA RIVERA: A lot of people, we just started drinking, doing drugs. The pain was just too overwhelming, and for me, I got in a car accident, a head-on collision, and two people got killed. LAWTON: She ended up in jail and rehab and turned her life around. Now she’s helping First Baptist organize ministries for other troubled women. RIVERA: I talked to my church family and said, look, these are mothers and aunts and grandmas that are in our community, come from good families, and we just have to stay on top of them. We’ve got to get them back to where they were before the storm. LAWTON: Another goal of First Baptist is to help repair the sense of community that was broken by the storm. 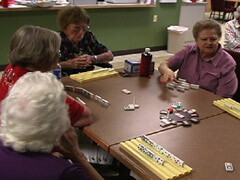 A women’s group called the “Domino Divas” meets every week for lunch, Bible study, and yes, some aggressive domino playing. These women were all displaced from their homes, and not all of them have been able to rebuild. They talked to me about the storm with a touch of humor. UNIDENTIFIED WOMAN: Katrina wasn’t totally bad, because she moved us and we didn’t have to pack. We didn’t have to pack a thing. We just threw it out of the window. LAWTON: But they’re all too aware of the pain that still lingers. UNIDENTIFIED WOMAN: Your house is gone, you didn’t get money for your life, all your stuff is gone, all your people are gone. It’s hard. LAWTON: Genny Jeffries, who is a family therapist, says the emotional and spiritual trauma from the storm is deep-seated. GENNY JEFFRIES: Katrina will always be in the back of our hearts, but we’re getting a little bit past it. But still there’s a lot of people, and a lot of circumstances that are there that really cannot, we can’t put it away, just can’t put it away yet. LAWTON: First Baptist is doing what it can, but there is a shortage of established members who can lead the ministries, and because of the economic situation there’s also a shortage of tithes and offerings. 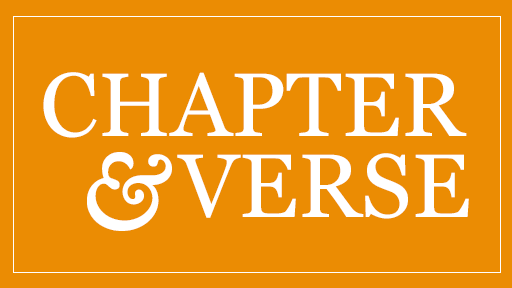 JEFFRIES: In the immediate aftermath of Hurricane Katrina, the great challenge was to survive. We have survived. The church is here and will continue to be here. Five years later, the great challenge is to sustain ourselves. LAWTON: The Jeffries have had personal stresses as well. Their home also had to be rebuilt through donations and volunteers, and shortly after Katrina, Genny suffered a brain aneurysm and then a post-surgical stroke. JEFFRIES: God and I had some rather serious conversations about that. It seemed that in the midst of losing everything else I pleaded with the Lord. I pleaded for him to spare my wife. LAWTON: Genny did recover, but Jeffries admits he wasn’t always as strong as he wanted to be in the midst of the crisis. JEFFRIES: I also know what it’s like to lay in a dark FEMA trailer, hugging your pillow, your wife next to you, terribly ill, recovering from traumatic surgery, not knowing if she’s going to fully recover, and just ask those questions of God that have no answer: Why? Why? Why? LAWTON: He may not have received answers, but he says he did receive assurances about his belief that God is there no matter what. JEFFRIES: The real focus has been that the things that I’ve preached and that I’ve taught all of those years are true. You can count on it. 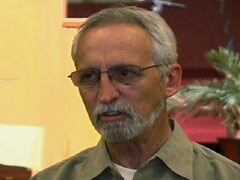 LAWTON: He says he’ll keep counting on it as First Baptist faces all the challenges still ahead. I’m Kim Lawton in Chalmette, Louisiana.